Posted on May 23, 2016 by Rebecca V.
Estella isn’t lying about playing hooky in school. She’s lying to save her life. 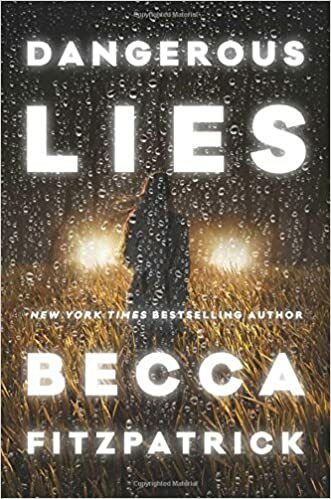 In the book Dangerous Lies by Becca Fitzpatrick, seventeen-year-old Estella is placed in WITSEC, a government protection program, after witnessing a murder. Estella has to change her name to Stella, and leaves her home, Philadelphia, in order to move to Thunder Basin, Nebraska. She leaves her dad who can never contact her again, her mom in rehab, her boyfriend, and her best friend. Stella moves in with Carmina, a retired cop. She’s very stubborn, and becomes friends with the nineteen-year-old, Chet, next door. Stella now lives a life where she has to lie to Chet, her co-workers, and everyone else in Thunder Basin, except Carmina, who is in on her secret. She makes friends, and of course makes an enemy, Trigger, who looks strangely familiar and is intent on finding out why she’s here. Stella tries to live a normal life until her eighteenth birthday. She plays softball and discovers how to live a real country life. Can Stella stay in Thunder Basin long enough without spilling her secret to Chet? Or will Trigger find out Stella’s secret before she can remember who he is? Only time can tell. I suggest this book to anyone who likes a good mystery. It wasn’t your ordinary plot, and you do get a little bit shocked at the end, but overall it was a great read. Dangerous Lives is available for check out from the Mission Viejo Library. it is also available to download from Overdrive. This entry was posted in Book Reviews by Rebecca V.. Bookmark the permalink.